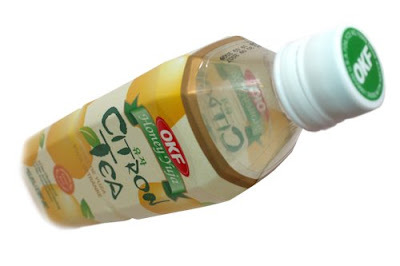 OKF Citron Tea , by same company as the Aloe Vera drink. What I first notice this bottle actually looks good for an Asian or Korean design. Compared to the OKF Aloe Vera drink this design look much better. Much cleaner simple and also more class and actually a very good design, they might have hired the correct designer for this then for the Aloe Vera drink. However for the taste, I rather drink the Aloe Vera then this. When drink it, it is not that bad but when you stop and get an after taste if horrible. The after taste is a kick of herbal taste and it pretty strong and made me a bit sick though. But the taste without the after tast is pretty drinkable and very much a good kind of lemon sirop taste, you can taste the sour in it too so it is not made to sweet that you can't taste it is sour. But still I like the design it is much better then the Aloe Vera, just the taste need some more improvement to remove the after taste. But won't be buying this again cause I rather drink the Aloe Vera also got a whole set of Aloe Vera mix with other fruits from an other brand will review those soon.